Ligaments are fibrous bands of connective tissue that link or hinge bones. They provide stability and support to the joints. 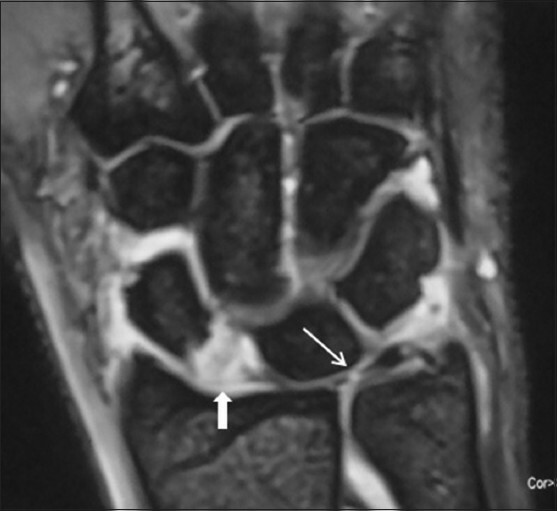 The Triangular Fibrocartilage Complex (TFCC or TFC) is a cushioning structure within the wrist. A fall on an outstretched hand can tear ligaments, the TFCC, or both. The result is pain with movement or a clicking sensation. During arthroscopic surgery, the surgeon can repair the tears. 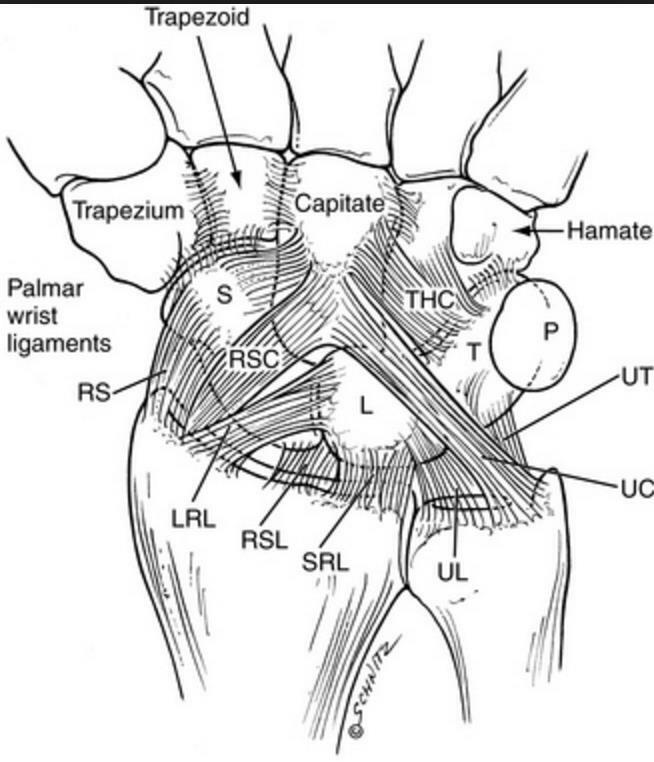 More commonly, ulnar sided wrist pain may occur without any history of trauma — inflammation which may be associated with the TFCC and cause of chronic wrist pain. The inflammation may be associated with a degenerative tear of the TFC or with synovitis of the complex. Often, there may be areas of inflammation, cartilage damage, or other findings after a wrist injury. Nonoperative management is typically successful in the vast majority of cases. In some cases, after the diagnosis is made, the condition can be treated arthroscopically as well. 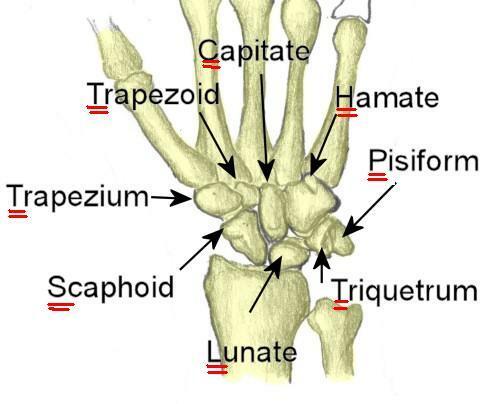 Patients with a wrist sprain typically complain of pain, bruising, and swelling. 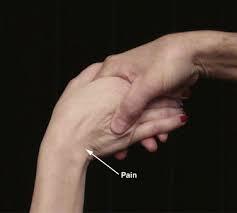 These symptoms are worse on the lateral (ulnar) side of the wrist. These symptoms may be associated with a traumatic event—like a fall or occur without any history of trauma. Patients with TFC injury will be tender over the distal ulna and may shows pain with specific hand surgery maneuvers (ulnar abutment, grind or shuck test). Most injuries of the TFC can be treated without surgery. It has been estimated that approximately 33% of adults over age 40 have a degenerative tear of the triangular fibrocartilage complex (TFC). These degenerative tears are not symptomatic in the vast majority of individuals. Initial treatments for TFC injury may include bracing, anti-inflammatory medications (e.g. ibuprofen, naproxen), and nonnarcotic pain medications. Often a steroid injection into the TFC complex is performed in the same setting and the wrist is allowed to rest for period of time. For non-traumatic tears, approximately 90% of patients will improve with conservative treatment. Once the initial symptoms have lessened, the patient begins a program of strengthening which may be accomplished at home or under the guidance of a hand therapist. The patient is then weaned from the brace while the wrist is strengthened. For patients who do not respond to conservative treatment or have other traumatic injuries—arthroscopic wrist surgery may be indicated. Usually, arthroscopic surgery requires only that the hand and arm are numbed (regional anesthesia). A sedative may be given to further relax the patient. Two or more small incisions (portals) are made on the back of the wrist. The arthroscope and instruments are inserted through those portals and the joint is observed through the camera on the end of the arthroscope. 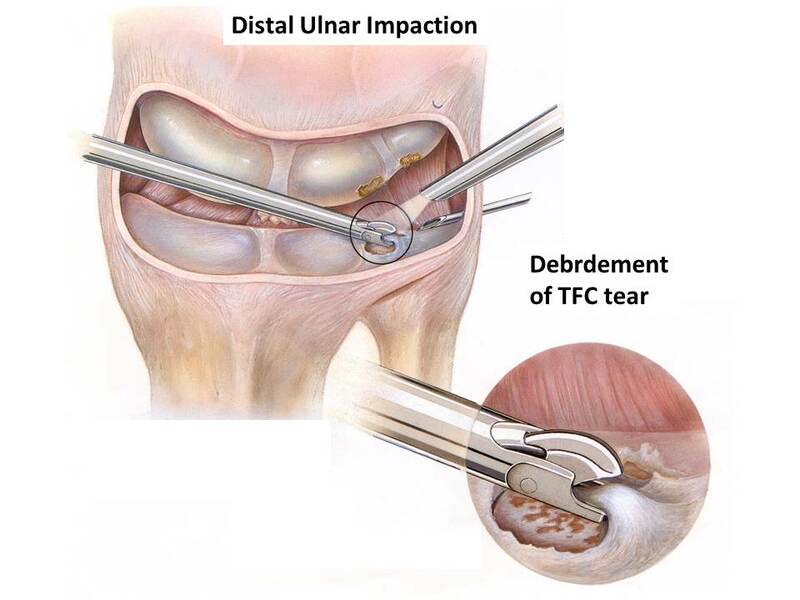 Central degenerative tears typically require debridement, while peripheral TFC tears may require repair. 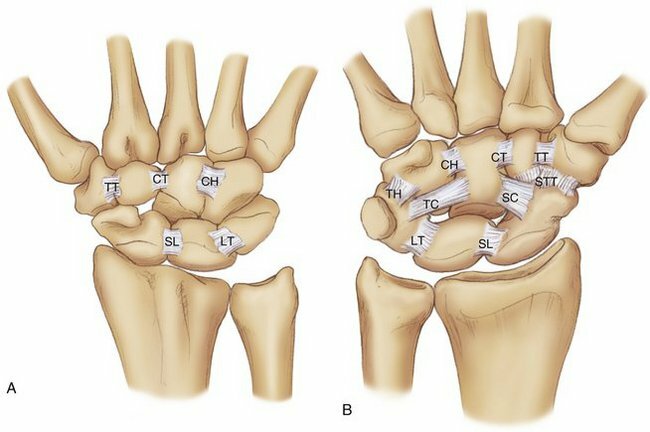 Ulnar positive wrists may benefit from ulnar shortening either arthroscopically, open or as an osteotomy. After the surgery, the incisions are closed with a small stitch and a dressing is applied. Sometimes a splint is used and may be transitioned to a brace postoperatively. Hand therapy or home therapy for range of motion and strength is initiated and length of recovery depends upon the surgical procedure undertaken.